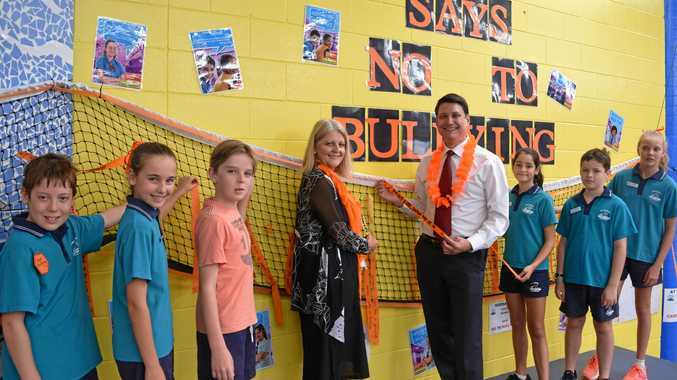 INSTEAD of tearing strips verbally and online at one another, the cool school kids at Noosaville on National Day of Action against Bullying and Violence wrote simple messages of encouragement on orange strips of paper ribbon. "Bullying is not cool", "Try being nice, "Care for others and "Bulling is bad" are some of the messages the school pupils on Friday hung up on the Say No to Bullying display at the school. Orange is the colour for Unity Day and is said to convey positive feelings like joy, fun, balance, encouragement and creativity. So that's why in schools all around Australia there was a sea or orange to help reverse all the slagging off and negativity that results in so much angst, upset, mental and even end in physical harm. The sad reality for many school students is they are harassed, belittled and even set upon by sneering peers. The Australian Covert Bullying Prevalence survey of 20,000 school kids aged from 8 to 14 showed one in four had been bullied. This found hurtful teasing as the most common bullying behaviour, closely followed by lies with bullying more common for Year 5 students (32%) and Year 8 (29%). The report found bullying by females tended to be more covert, while males were more "in your face" about it and then there was online bullying that follows students home. She said the Bullying. No Way message is "absolutely important and vital for our students and our community" and she said the school leaders are helping set the example of caring for your school mates. "What we need to do, and we always do every day, is embrace what the differences are and celebrate the uniqueness of every child and every person," Ms Rieger said. "It works in well with our school motto - Be the best you can be," she added. John Hague from one of the school's best backers, the Bendigo Bank, was on hand to help spread the message that everyone deserves to be shown respect. His message on his orange tape was: "Enjoy life, don't do it (bullying)." About 570,000 students around Queensland were asked to imagine a world free from bullying.